Dental implants are continuously improving during the last 25 years. The first dental implants which were discovered in Sweden by Professor Branemark have been modified and redesigned completely to what we are using today. Dental implants are made of titanium and look like small screws. These small titanium screws are inserted into the jaw bone during a small minor operation. 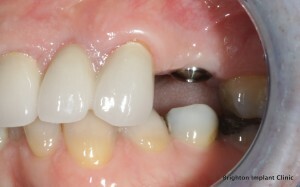 Dental implantology itself is a large part of dentistry today. Even though it is an integral part of dentistry in modern times it is still not offered in many general dentistry clinics. How do I find a reputable Dental Implant Clinic ? In order to be able to place dental implants properly a dentist must gain sufficient experience in general dentistry. Further post graduate education is then needed in order to understand the theory of dental implants and the clinical hands on skills for placing dental implants safely. Many dentists choose not to offer dental implants to their patients. These practices may refer patients to specific dental implant clinic for their patients who need dental implant treatment. Dental implant clinic are usually referral centres that only deal with dental implant treatments. It is important to have some knowledge about your implant dentist and the procedure before going ahead with debtal implant treatment. It is a good idea to research the dentist’s experience and training prior to dental implant treatment, find out how many implant procedures they have performed and their success rate. A good Dental Implant Clinic should be able to provide before and after photos of other dental implant treatments they have performed and should explain every step of your treatment in full so you know what to expect. This should also be given to you in writing as a treatment plan so you can take the time to absorb the information and make an informed decision. Risks and benefits of the dental implant treatment should also be explained to you in full. Brighton Implant Clinic is, as the name implies, a dental implant clinic. At Brighton Implant Clinic we are totally committed to providing the best dental implant treatment to our patients. Our team is highly skilled, experienced and devoted to delivering the highest customer service and quality of treatment. We are also proud to offer the most affordable dental implant treatment in the UK. A single dental implant costs only £995. This cost includes the cost of the initial assessment, a panoramic radiograph, the implant itself, abutment and porcelain crown. 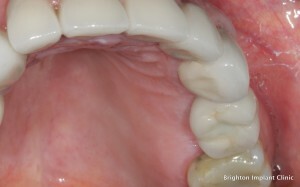 For more information please feel to Contact Brighton implant Clinic or Call us on 0800 111 6623 .